1. Cushion - Different socks have different levels of cushion. More cushion sounds good right? Could be as long as you don't mind a little extra sock. I tend to opt for higher cushion socks for long run days or in colder weather and pick up my thinner socks when it's warm and/or it's a shorter run. The thickness of your socks can also impact how your shoes feel, so keep that in mind. Left - high cushion. Right - low cushion. 2. Compression - There is a lot of literature out there that speaks to the benefits of compression - support, circulation, etc. Since so much of running relies on happy feet, its not surprise that you might want to consider compression. Running socks can run from zero compression, to targeted compression (usually focused on the arch), to medical grade compression. Did I mention Swiftwick is from Tennessee?! Woo hoo! 3. Construction - Anyone who has worn the wrong socks knows that it can really hinder a great run. Make sure your sock comes up high enough so that there isn't any rubbing with your shoes. Some brands (Feetures and Swiftwick among them) have a Y heel design that prevents bunching. Others, Wright Socks in particular, have a double layer to avoid blisters. Pick the construction that works for you, but pay close attention to seams and make sure you get the right size for your feet. Left - low profile Feetures with achilles-protecting tab. Right - Wright Socks double layer. 4. Composition - Like any piece of running clothing, you're going to want it to wick - no one wants soggy socks! Get socks intended for running and made with runner friendly materials. You may have seen some socks made with wool or a wool blend that are supposed to help with wicking and stink. Icebreakers is one of the biggies in this area. Personally, I don't prefer them, but I know some people do. 5. Color - Hey if you get the first four right, pick something that appeals to you. If you have running clothes you're excited about (even the lowly running sock), you might be even more motivated to get running. Running socks fit for a princess! 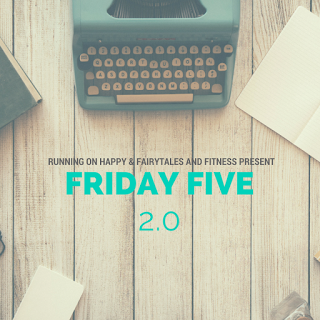 Today I'm linking up with some fabulous bloggers for the Friday Five 2.0. Thanks to Running On Happy and Fairytales and Fitness for hosting. Check them out! How often do you replace your running socks? I've always thought the right sock is just as important as the right shoe. Anyone who has suffered with half-dollar sized blisters on their feet can certainly understand. Swiftwicks are my favorite! I didn't know they were a TN company. I love Swiftwicks, too. They feel like they are giving my feet a hug :) I know it can seem crazy to drop significant money on socks (good running socks don't come cheap), but you're right. One bad experience is enough to make you invest more wisely in the future! Thanks for linking up with us as we try to continue the Friday 5! I have different socks that I wear on the trail rather than on the sidewalk. Even though I prefer the ankle socks, I need them a bit higher when I run on the trail! That's a really good point! The type of running (terrain) matters as well. I've honestly never really done trail running, but I think I would really like it. Good to know I may need to include some different socks if I get off the pavement! Running socks is something I don't pay very much attention to. As long as they go up high enough so my skin doesn't rub on my shoe, it's all good. That being said, I do like buying the cushy kind! My absolute favorite socks are Balega. I was introduced to them when I got my first pair of Hoka One One running shoes. Because I have a narrow foot the sales person at Fleet Feet suggested that I might prefer a slightly thicker sock so my foot wouldn't slip around. These are the ones for me. Nice and cushioney but great wicking too. You are right that good running socks are not cheap but I keep my eyes open for a sale. Sometimes the running stores offer buy 2 get one free. That's when I stock up. Great post--I never really put much thought into my socks beyond cushioning. My favorite socks are from Balega-- the blister resist ones because my feet are so prone to blistering. Thanks Stacey! I've been hearing such great things about Balega. I may have to give them a try! Feetures are my FAVORITE. I don't know how many pairs I have! I've been loving Features socks over the past few years! But as you mentioned on the composition, on the wettest winter days I do love me some wool running socks to help keep my feet as warm and dry as possible! I think you covered all the angles! I like Smartwool running socks in the winter. I wear compression socks for racing and recovery but wear Roadrunner Sports brand socks for every day runs. I have to admit, I just buy socks without doing much research. I used to run exclusively in Asics socks from the big box store but recently got a third pair of Feetures! that are more cushioned than the first two I owned (and rarely ran in) and I must say, I like them a lot. I replaced all of my running socks about a year ago after doing a bit of research and they are all bright, fluorescent colors and I LOVE them! :) They definitely make me smile when I put them on for a run!